As the Eagles kick-off the second day of their final OTA, one player that didn't participate in practice was second-year wide receiver Jeremy Maclin. An Eagle official said that Maclin has a "tight" hamstring. Even though Maclin did not partake in the on-the-field practice, he was still working with trainers and condition on the sidelines. Still, with Kevin Kolb in his first full-year at quarterback, the Eagles were hoping he would get as many reps as he could with his starting duo at wide receiver. 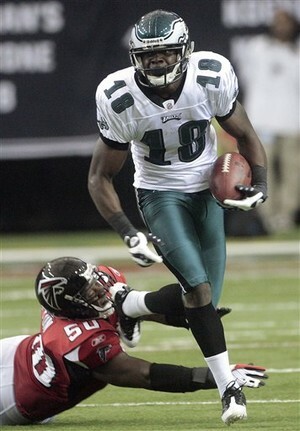 Instead, Kolb does not have either DeSean Jackson or Jeremy Maclin. While the Eagles are probably just taking the side of caution with Maclin, the injuries for this squad are beginning to mount up. Todd Herremanns, LeSean McCoy, Ellis Hobbs, Victor Abiamiri and Stewart Bradley have all missed practice due to an injury. Additionally, the team lost do-it-all defensive back Marlin Jackson for the season with a ruptured Achilles tendon. Eagles fans should be holding their collective breathes in hopes nothing else goes wrong in the final couple of days of OTAs. On Tuesday the Eagles announced that they have signed undrafted free agent Minnesota linebacker Simoni Lawrence. Lawrence came to terms with the Rams following the 2010 NFL Draft, but on May 25 the Ram cut him loose. In only two years at Minnesota, he was named a co-captain of the defense and earned honorable mention All-Big Ten as a senior. In his college career, he registered 151 tackles, six sacks, two interceptions and two touchdowns [one interception and one fumble return]. However, before he arrived on the campus at the University of Minnesota, he played two seasons at Valley Forge Military Academy. At the Academy, he played a pivotal role in the Cadets back-to-back conference titles. Furthermore, he was twice named the Seaboard Football Conference Player of the Year. Before he flourished as a Golden Gopher and Cadet, Lawrence played his high school ball at Upper Darby [in the Philadelphia area] as a running back. While Lawrence grew up as a hated Cowboys fan, but he is excited to be back in the city he grew up in. "This is a dream come true," he said. "To stay home in Philadelphia, I'm so happy to be out here. I just love the area. So glad to be here, I can't even explain it." Still, Lawrence has an uphill battle making this team. Last year the Eagles had issues all over the field at linebacker, but heading into the 2010 season they have a plethora of talent at the position. If Lawrence expects to make the team he must try to supplant Akeem Jordan, Moise Fokou, Joe Mays, Stewart Bradley, Omar Gaither, Ricky Sapp, Alex Hall, Jamar Chaney and Keenan Clatyon. The best-case scenario for Lawrence is that he makes an impression in the preseason games and gets a chance to be picked up by another team. It is great that they are giving Lawrence a go, I think he can be a player in this league.